Hainan Group from the Southern province of People’s Republic of China has expressed interest to set a special rubber export processing zone in Moneragala and North East Sri Lanka, said Minister of Plantation Industries, Navin Dissanayake. He expressed these views after he met the Chief Coordinator of Rubber Development Zone manufactures in Hainan, Jinglei Han who led an investor delegation to the Ministry of Plantation Industries yesterday. The delegation representing Hainan Group the largest rubber manufacturer in the world was keen to lease land from Moneragala area and plant hybrid, high yielding rubber plants. In addition the investors are also keen to provide hybrid rubber plants to local planters enabling them also to be a part of this development. This would be the first stage of the project development and thereafter several rubber based manufactures from Hainan Province would set up factories in Sri Lanka to export rubber based products to the world using the Hambantota harbour. These manufactures will also purchase latex from local growers at a higher price which will also entice local growers to move to the rubber plantation again. The increase in rubber plantations will also help Sri Lanka to reduce the imports of rubber for local manufacturing which is currently a major issue. To implement this program Minister Dissanayake will travel to Beijing in April to ink the MoU. Subsequent to this MoU, scientists from the Hainan Group will visit Sri Lanka to identify land to implement this project on a PPP basis. They will also make use of the Sri Lanka 2025 Rubber Master plan which was put together by the Plantation Ministry. 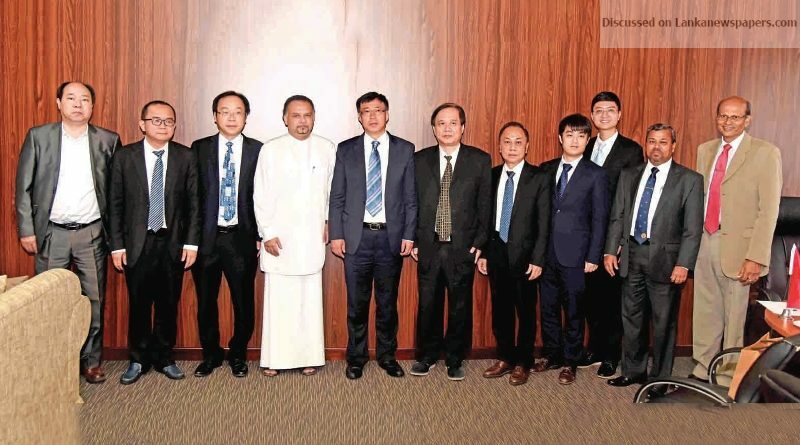 Hinan group officials from China on a three day visit in Sri Lanka also met Minister of Development Strategies and International Trade Malik Samarawickrama, officials from the Rubber Secretariat, BOI and other related stakeholders. The first stage of this project will start in four months and when completed it would be the biggest ever investment made to the rubber sector in Sri Lanka. As a good will gesture the Hainan Group will provide 1,000 ‘electrical rubber cutting machines’ to Sri Lanka free of charge after the signing of the MoU. This in turn will reduce the labour demand of the industry to a greater extent.